Imagine if you could go to the profile of a friend of Foursquare and instead of scrolling through the long list of coffee shops they’d checked into in Berlin, you could simply click a button and add all their recommendations to your personal map in one go. That’s essentially the offering of Cool Cousin, an app and web site which is mining one of the last bastions of social media not entirely figured out by Facebook: the social recommendation of places. The startup has now raised a $2M seed funding round, led by Elevator Fund, which will be used to scale up the platform. Cool Cousin builds communities in cities around the world of captivating locals (aka “Cousins”) who LOVE their city and are passionate about sharing it with others. The app then allows users to directly connect with these Cousins who spark their interest. 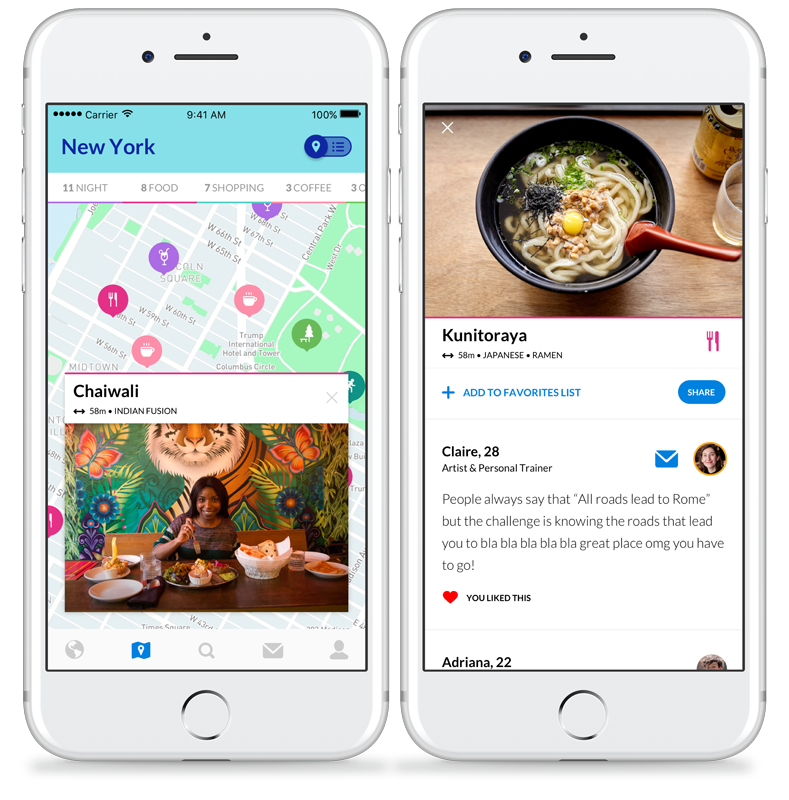 On opening the app and selecting your Cousin, you get a curated guide of all their top picks and personal insights and find places and activities. You’re encouraged to message Cousins and get info directly from locals in the know. Add a cousin or two with a tap, and you’ll get access to their “map” of spots to check out. All the map pins have their own category icon so they are easy to distinguish. If you are already in a location while using the app, you can click on the name of the attraction and get help by clicking “Book Table” for restaurants, “Request Pickup” to get a ride from Uber, “Directions” and more. Got a question? 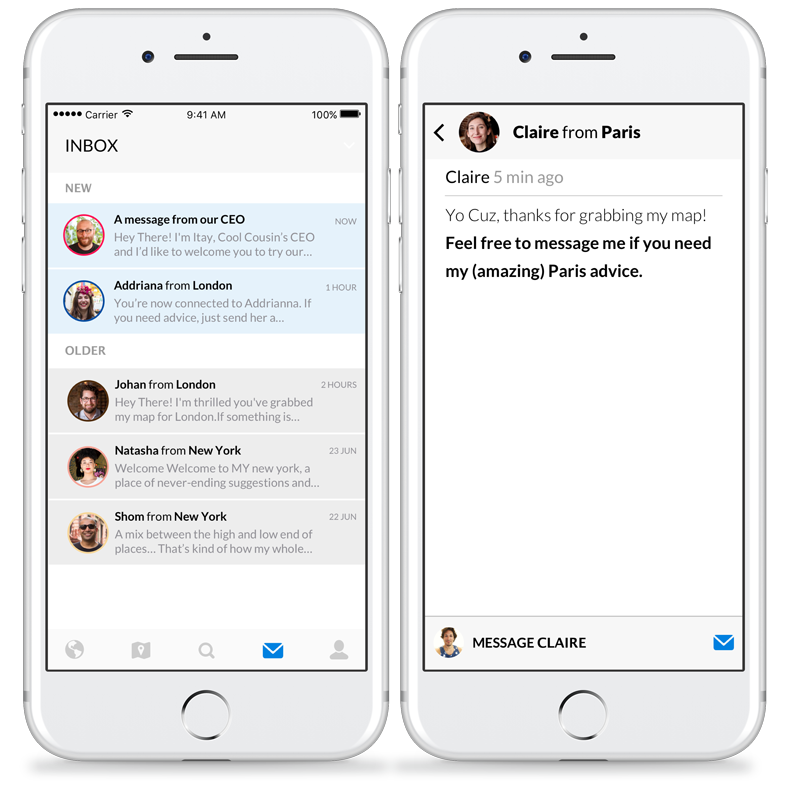 You can use the app to message your “cousin”. In that sense it’s a bit like a virtual GetYourGuide, where instead of actually meeting a guide, you download their curated places and chat with them virtually. They could in theory use this data to build more of an AI, but for now, it’s all human curated, and that’s actually its true appeal. The company was founded in 2016 and has hundreds of Cousins in more than 45 cities around the world. Their guides and insights then encourage other users to become experts on their cities. The more a Cousin’s map gets downloaded by other users, the higher they are ranked for their city. The app also allows offline access to the information. They’ve also put in some effort to collect good contributors, from Experimental Cocktail Club founder Xavier Padovani, well-versed in the best of London nightlife to Secretsundaze Studio founder James Priestly, an expert on the music scene. Cool Cousin’s founders did not come from the travel industry, but rather joined forces to launch and run the largest ever grassroot political campaign in Israel. Although that campaign failed, it led them down the path of creating this app. The company has five co-founders—CTO Gil Azrielant, COO Itamar Weizman, CPO Shachar Cotani, CMO Nadav Saadia, and CEO Itay Nagler. This platform addresses a real user need. With literally oceans of reviews of venues, there’s a growing sense of information overload amongst people. Why else are AI-driven chat bots and quizzing Alexa seen as the next wave of interface? Thus, finding an app where you can see people who might match your outlook and simply ask them questions in a live environment seems like a great idea. And let’s be brutally honest. Many people will pick their Cousin because they find them attractive. Right? It’s just human nature. Cool Cousin gives them excuse to ask them a question because these people have already put themselves out there as experts. That’s not an explicit or stated goal of the company, of course. Now, there are a handful of possible directions for this startup, or perhaps a combination of them. Firstly, the app has the potential to create social currency for its contributors, in the same way people work their Instagram profile work to become a noted influencer. They then parley that into other things. But would you like to be messaged at 3am from some random stranger asking if you could recommend a cool bar in Paris? No. So, secondly a compensation system for cousins, who currently work on a volunteer basis, could be another strategy. Thirdly, the platform could be paid directly by local partners such as local governments or travel firms on event-specific promotions. Or by venues themselves. However, taking the route of becoming a social platform, where a person could become “hot” like they can be on Twitter, Facebook or Instagram, would be the cheapest and most immediately scalable option. If Cool Cousin could achieve that then this startup is really onto something.